In this 100 page issue Gary Drayton gives his advice and guidance on beach and underwater detecting and shares his spectacular finds and Minelab Equinox preferred settings. 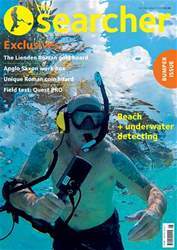 Sid Perry also field tests the Quest PRO and also takes the Minelab Excalibur II to the local river and he shares his hints and tips on taking to the water. We have a spectacular Roman gold coin hoard from the Netherland and a unique Roman coin hoard from Gloucestershire too. We also feature an Anglo Saxon work box thought to be from a female’s grave discovered at Detectival 2017!